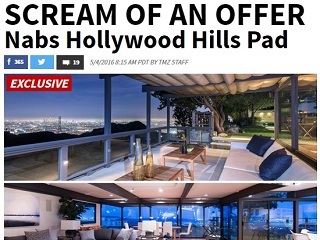 TMZ, U.K.'s The Sun and others riff on the sale of late filmmaker's Hollywood Hills home. TMZ claimed the exclusive this week on the news that Million Dollar Listing Los Angeles stars Josh and Matt Altman had sold the Hollywood Hills home of Wes Craven, who passed away last summer at age 76. In typical tmz.com website style, there were puns galore. Other outlets punning with coverage of the purchase of the home, owned previously by actor Steve McQueen, include U.K.’s The Sun, which also liked “horror-ably,” and The Real Deal L.A., which termed the sale amount a “scary-good deal.” For what it’s worth, the L.A. Times “Hot Property” column opted for pun-free coverage.